Horizons at Woodlake Greens is an active adult community of about 400 homes located in Lakewood, NJ. 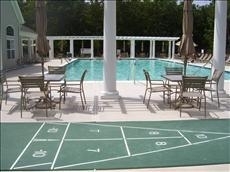 The community features a clubhouse complete with fitness center, multi-purpose room, card room, billiards, and more. Outside features heated outdoor pool, bocce courts, etc. Association fees are $186 a month. Woodlake Greens, built by Maplewood Homes, began construction in 2007 and is still building today. Homes range is size from 1659 sq. ft. to 2438 sq. ft. and features ceramic tiles floors in kichen, foyer, and bathrooms, master soaking tub, energy saving features and more. Many options are also available when building. The community backs to a golf course so many lots are very private. Wooded homesites are available. Prices range from $259,900 to $349,900. Horizons at Woodlake Greens is located in Lakewood, NJ with easy access to the Garden State Parkway, Interstate 195, Rt. 9, Rt. 70, and Rt. 88 and it is only 8 miles from the shore. It is on the Brick/Lakewood border. Shopping is less than 5 minutes away with a huge amount of shoppign choices. The Freehold Mall is 20 minutes away.